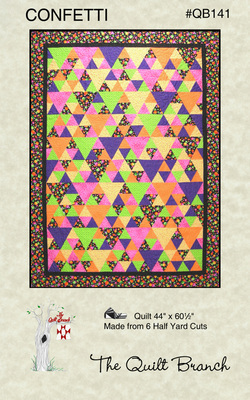 This quilt is 60 degrees of fun to make using your favorite bundle of 6 half-yard cuts. We show you how to quickly cut the triangles and then it is up to you to toss the "Confetti" on your design wall. ​A quilt in the Six Halves Make a Whole series, the entire center of this quilt is made from the bundle. Then you select the borders, backing and binding to complete this 44" X 60 1/2" lap size quilt.